The Costa de Almeria possibly has one of the best climates of all Spain. It was not developed at the time of the better known costas and it is possible to find quiet beaches and small resorts yet you will also find villa and apartment rentals or B&B. The main resorts are Requetas de Mar and Almerimar, modern resorts on a flat peninsular just west of Almeria city, and Mojacar, a more spread out low rise Spanish feeling resort north east of the city. Other places of note are San Jose, Agua Amarga and Carboneras on the Cabo de Gata Natural Park, east of Almeria, along with the fishinig town of Garrucha and Vera Playa, just north west of Mojacar. Also on the Caba de Gata coastline you will find the small vilages of Las Negras and Agua Amarga with their sandy beaches. Part of Vera Playa, including a 3Km stretch of beach, is a naturist area. 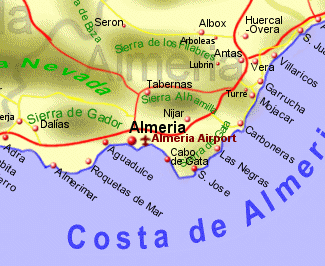 The Costa de Almeria is serviced by Almeria airport which is withn 1hrs drive to all parts although the north of the costa is also serviced by Alicante, approximately 2hrs drive to the north. The southern end of the costa is also serviced by Malaga airport, approximately 2- 2.5hrs drive to the west. Almeria city also has a Ferry Port where there are ferries to north Africa (Morocco, Algeria, and the small Spanish enclave of Melilla.